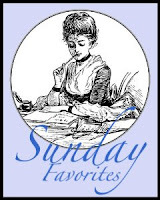 Chari @ Happy to Design is hosting Sunday Favorites where we get to re-post a previous item to save us time on a Sunday. Now if I can just do this for Monday, Tuesday, Wednesday......if you get the idea. This one is from last summer. We were attending a double birthday party on Saturday night. I must say I was inspired by all the lovely tablescapes you ladies always create when it came to the gifts. I made up two baskets with a black & white theme. I started with black woven place mats and added two clear rippled dinner plates and two salad plates. I used black and white dish towels as giant napkins. There was a bottle of wine for each of them and two stemless glasses. A nice Malbec for one and a bubbly Proseco for the other. I found pretty white frosted candle holders with white lettering. I put two special chocolate mousse truffles in the little black boxes tied with white ribbons. The wine bottles went into special black wine gift boxes with a cut out front for the label. I set this on a bed of white and gold shredded filler into the white trays and wrapped it all up with a black patterned cellophane. The card hung on the outside was a pretty swirled black and white card stock on which I wrote with a white pen. Last but not least was each ladies initial done in wood hanging on the outside with the white and black polka dot ribbon. Apparently the offer to cook them dinners was the only thing missing from these gifts. Wow can you be my personal shopper and gift wrapper -- seriously!!! Ohhh...I love, love, LOVE your gift baskets!!! And...I would just love getting one of these!!! Love that you chose to do a "black and white" theme...it's gorgeous!!! So very classy! What great gifts you included too! I bet your friends just loved these!!! This is a great idea...I'm definitely going to put this in memory!!! What a great post to reshare with us today for Sunday Favorites, my friend! I missed it the first time around...what a great idea...and what a treat!!! Thank you!!! I love the gift - I always want to do something clever like that - I am very impressed. THAT is a really adorable little birthday basket! I don't drink, but I BET without much trouble at all I could substitute some Welch's bubbly!!!! okay Lori, so where do I sign up to get on the "birthday gift list"???? LOL Love it! You asked me a question re the silver, but I'm not sure if you're telling me that mine isn't South Seas, or yours? Maybe I'm having a gray moment? Those look amazing.What a great friend!!! what an awesome idea!!! thanks! What a good idea. Really nice, I like the black and white. I'm glad you re-posted as I missed that one! Love the black and white theme. Such a perfect gift right before Valentine's Day too! Great gift..I am sure they loved it!